This cave was constructed in the Tang dynasty and its corridor was renovated in the Song dynasty. It has a truncated pyramidal ceiling and a west niche. The ceiling of the main chamber features a medallion pattern formed by four cloud motifs and the draperies extend to the four slopes which are covered with the thousand Buddha motifs with a seated Buddha in the center. The tent-like ceiling of the west niche contains a five figure group: one Buddha, two bodhisattvas and two disciples. The U shaped altar has six small frames decorated with musicians. The center of the niche ceiling highlights a painted medallion. The west slope is decorated with draperies on the upper and two screen paintings below, which illustrate Buddha's life stories including the bathing scene of the prince by nine dragons. The north slope shows the same design as the south one, but the screen paintings illustrate the Three Assembly of Maitreya, namely the Maitreya sutra illustration. The edge of the niche is decorated with ocean pomegranate and twisted vines. On the upper of the niche are curtain designs with an apsara on each side. There is an adobe platform on each side alongside the niche, and there was originally a statue (now lost). Below the niche are images of Manjusri, Samantabhadra and Mt. Wutai. Alongside the niche on the south side is an illustration of Samantabhadra, and on the opposite side is that of Manjusri. The south wall depicts the Diamond sutra illustration on the west side and the Amitayus sutra illustration on the east side, both having screen paintings below (vague). 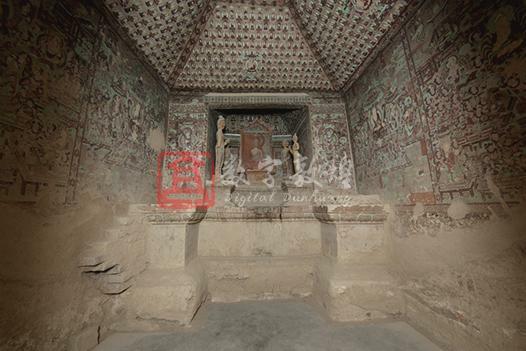 The north wall depicts the Panikarasuttau sutra illustration on the west side and that of the Medicine Buddha on the east side, both having screen paintings below (vague). On the east wall, the illustration of Defeating Mara is in the center above the entrance and the Maitreya sutra and Avalokitesvara illustrations are respectively on the south and north sides of the entrance. On the wall above the entrance is an illustration of Defeating Mara. The north and south side of the entrance are respectively occupied by the Avalokitesvara (imcomplelte) and Maitreya sutra illustrations. The Avalokitesvara sutra illustration has two side scenes. The left ones depict the disasters of meeting poisonous snakes or scorpions, encountering the lightning, being trapped by Mt.Kumgang, being shackled and etc, and the right ones depict the disasters of meeting evil beasts, encountering robbers, being caught in fire or falling in water. The other scenes are obscured. The south wall contains the Diamond sutra illustration and the Amitayus sutra illustration, below them are a few screen paintings that have been obscured. In the Diamond sutra illustration, Sakyamuni Buddha sits in lotus position in the center flanked by various bodhisattvas, Shravaka and heavenly kings. The upper part is a landscape of floating clouds and a river that runs into distance. The upper left corner shows scenes of giving offerings and interpreting the Diamond sutra for people, and upper right corner contains scenes of giving offerings and being humble as a blessing.The lower part contains pagodas and stories of Kalingka. In the Amitayus sutra illustration, Amitabha sits in the center flanked by Avalokitesvara and Mahasthamaprapdta under the central treasured platform. Around them are the celestial beings and bodhisattvas. Below the platform is a rippled pond. In the foreground is the scene of dance and music, and in the back are temples and pavillions. In the sky, numerious bodhisattvas come on clouds, and music intruments giving out music without being played. The tent-like niche in the west wall has a painted laternendecke motif, Buddha and bodhisattvas on the ceiling. It has a U-shape altar on which stands a five-figure group, including a Buddha, two bodhisattvas and two disciples. Below the niche there are some small frames decorated with Musicians performing music and dancing. There are three screen paintings in the niche repectively represent the bathing scene of the prince and the shaving scene, imitating the six connected screen paintings used in the court of the Tang government. The two sides out of the niche depict the illustrations of Manjusri and Samantabhadra. The north wall has a Panikarasuttau sutra illustration and the Medicine Buddha illustration, below them are screen paintings (vague). The former is painted according to the Panikarasuttau Sutra. The preaching scene is based on the Introduction of the Sutra, which is painted in the center. Sakyamuni sits on a lotus throne surrounded by the bodhisattvas, disciples and celestial beings who listen to the preaching attentively. In front of the altar is the scene of dance and music. Below it is the story of Ananda meeting a son of a Brahman while begging alms. The east side is devoted to the Sujata Jataka, and the west side to a jakata story of a lion and a young bhiksu converting a group of robbers by helping the abbot. Behind the parasol is a landscape symbolizing Mt. Grdhrakuta, in which the story of Mother Deer from the Chapter of Upadesa is rendered. The two upper corners are used for the Upadesa, the east lower corner for the Chapter of Intimacy, and the west lower corner for the Introduction.Though similar to that of the Amitabha sutra illustration in composition, the Medicine Buddha sutra illustration has an image of 12 generals. In this illustration, all the people are on the central platform, on which the Medicine Buddha sits in the center, flanked by the Moonlight bodhisattva and Sūryaprabha bodhisattva, while the other figures stay on both sides. In the foreground is a scene of dance and music. The platform is above the water, connecting with the halls and pavillions around. The buildings are grand and the outline drawings are clear and complete. a medallion design formed by four cloud motifs.